4:00 o'clock in the morning, when dozens of people across the steep path up the hill in the village of Penanjakan Dua (Ngadisari), District Sukapura, Probolinggo, East Java, in early 2012. Cold weather and drizzle through the night did not make the tide of explorers. Beautiful scenery at sunrise and view of Mount Bromo, Batok, and Semeru tough side by side into the reasons people continue to roam. By wearing gloves or a thick jacket of people waited patiently. Minute by minute, all such tirelessly watching the eastern horizon. Several others approached the stalls which opened local residents who provided food and warm drinks. According to one trader, if sunny, four-thirty already seen its sun. Thick clouds blocking the sun was first published. Explorers was disappointed. However, disappointment paid off when darkness unfolds. Three mountain chains were welcomed warmly. A year ago Mount Bromo is so quiet. Only a native of Tengger tribe who lived. Never mind the hill Penanjakan, Village Ngadisari usually crowded by tourists, too quiet. 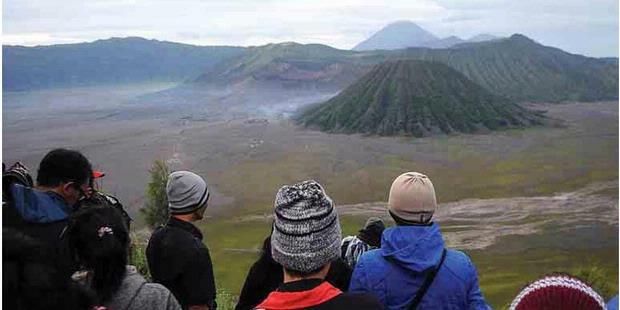 Mount Bromo is closed to tourism activities. Even if they still want to see, is only allowed from a distance of 3 kilometers. A year later, the cars four-wheel-drive milling tourists back. The horses whinnied again ready to take tourists through difficult terrain.